He studied in the common schools of Windsor, Vermont, and Worthington, Ohio, and at Cincinnati College before entering the junior class at Dartmouth College. He was a member of the Alpha Delta Phi Fraternity and Phi Beta Kappa,  and graduated from Dartmouth with distinction in 1826. While at Dartmouth, he taught at the Royalton Academy in Royalton, Vermont. Chase then moved to the District of Columbia, where he opened a classical school while studying law under U.S. Attorney General William Wirt. He was admitted to the bar in 1829. The Salmon P. Chase Birthplace and childhood home still stands in Cornish, New Hampshire. Chase moved to a country home near Loveland, Ohio,  and practiced law in Cincinnati from 1830. He rose to prominence for his authoritative compilation of the state's statutes,  which long remained the standard work on the topic. From the beginning, despite the risk to his livelihood,  he defended people who escaped slavery and those tried for assisting them. He became particularly devoted to the abolition of slavery from the death of his first wife, Katherine Jane Garmiss, in 1835, shortly after their March 1834 wedding, an event which was a spiritual reawakening for him. He worked initially with the American Sunday School Union. At a time when public opinion in Cincinnati was dominated by Southern business connections, Chase, influenced by local events, including the attack on the press of James G. Birney during the Cincinnati Riots of 1836, associated himself with the anti-slavery movement. Chase was also a member of the literary Semi-Colon Club; its members included Harriet Beecher Stowe and Calvin Stowe. Chase became the leader of the political reformers, as opposed to the Garrisonian abolitionist movement. For his defense of people arrested in Ohio under the Fugitive Slave Law of 1793, Chase was dubbed the Attorney General for Fugitive Slaves. His argument in the case of Jones v. Van Zandt on the constitutionality of fugitive slave laws before the U.S. Supreme Court attracted particular attention. In this and similar cases, the court ruled against him, and the judgment against John Van Zandt was upheld. Chase contended that slavery was local, not national, and that it could exist only by virtue of positive state law. He argued that the federal government was not empowered by the Constitution to create slavery anywhere and that when an enslaved person leaves the jurisdiction of a state where slavery is legal, he ceases to be a slave; he continues to be a man and leaves behind the law that made him a slave. Elected as a Whig to the Cincinnati City Council in 1840[ citation needed], Chase left that party the next year. For seven years he was the leader of the Liberty Party in Ohio. He helped balance its idealism with his pragmatic approach and political thought. He was skillful in drafting platforms and addresses, and he prepared the national Liberty platform of 1843 and the Liberty address of 1845. Building the Liberty Party was slow going. By 1848 Chase was leader in the effort to combine the Liberty Party with the Barnburners or Van Buren Democrats of New York to form the Free Soil Party. Chase drafted the Free-Soil platform  and it was chiefly through his influence that Van Buren was their nominee for President in 1848. In 1849, Chase was elected to the U.S Senate from Ohio on the Free Soil ticket. Chase's goal, however, was not to establish a permanent new party organization, but to bring pressure to bear upon Northern Democrats to force them to oppose the extension of slavery. He was a leader in the movement to form a new party opposing the extension of slavery. He tried to unite the Free Soilers and the anti-slavery Democrats with the dwindling Whig Party, which led to establishment of the Republican Party. " The Appeal of the Independent Democrats in Congress to the People of the United States", written by Chase and Giddings, and published in the New York Times on January 24, 1854, may be regarded as the earliest draft of the Republican party creed. Chase sought the Republican nomination for president in 1860[ citation needed]. With the exception of William H. Seward, Chase was the most prominent Republican in the country and had done more against slavery than any other Republican. 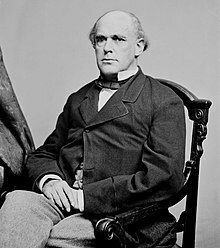 But he opposed a " protective tariff", favored by most other Republicans, and his record of collaboration with Democrats annoyed many Republicans who were former Whigs. At the 1860 Republican National Convention, he got 49 votes on the first ballot,  but he had little support outside of Ohio. Abraham Lincoln won the nomination, and Chase supported him. Chase was elected as a Republican to the U.S. Senate from Ohio in 1860. However, he resigned shortly after taking his seat in order to become Secretary of the Treasury under Lincoln. 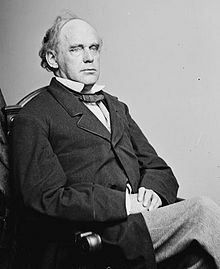 He was also a participant in the February 1861 Peace Conference in Washington, D.C., a meeting of leading American politicians held in an effort to resolve the burgeoning secession crisis and to preserve the Union on the eve of the Civil War. 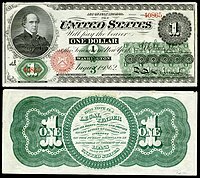 The first U.S. federal currency, the greenback demand note, was printed in 1861–1862 during Chase's tenure as Secretary of the Treasury. It was Chase's responsibility to design the notes. In an effort to further his political career, his face appeared on a variety of U.S. paper currency, starting with the $1 bill so that the people would recognize him[ citation needed]. Perhaps Chase's chief defect was an insatiable desire for high office. 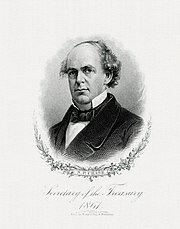 Throughout his term as Treasury Secretary, Chase exploited his position to build up political support for another run at the Presidency in 1864. He also tried to pressure Lincoln by repeatedly threatening resignation[ citation needed], which he knew would cause Lincoln difficulties with the Radical Republicans. In June 1864, Lincoln surprised Chase by accepting his third offer of resignation. The Republican Party had at that point already nominated Lincoln as its presidential candidate and the Treasury was in solid shape, so Lincoln no longer needed to keep Chase in the cabinet to forestall a challenge for the presidential nomination. But to placate the Radical wing of the party, Lincoln mentioned Chase as a potential Supreme Court nominee. Hepburn v. Griswold (75 U.S. 603), 1870, which declared certain parts of the legal tender acts to be unconstitutional. When the legal tender decision was reversed after the appointment of new Justices, in 1871 and 1872 ( Legal Tender Cases, 79 U.S. 457), Chase prepared a very able dissenting opinion. Chase died of a stroke in New York City on May 7, 1873. His remains were interred first in Oak Hill Cemetery in Washington, D.C., and re-interred in October 1886 in Spring Grove Cemetery, Cincinnati, Ohio. Chase had been an active member of St. Paul Episcopal Cathedral, Cincinnati. Chase's birthplace in New Hampshire was declared a National Historic Landmark in 1975.